Makalawena might be the best beach on the Big Island that can't be reached by road. There are several bays scooped out of the Kona Coast with gorgeous white sand and plentiful shade from palm trees. The hike out to Makalawena keeps the crowds away, especially on weekdays. It's really tough to find a more perfect beach anywhere in the Hawaiian island chain. Swimming is usually pretty safe when waters are calm. The land behind Makalawena is private. The most northerly bay has a protected spot that's very calm. ʻŌpaeʻula Pond is behind Makalawena and its twelve acres are a National Natural Landmark that protects nesting and breeding areas for some native Hawaiian birds. It's surrounded by private property, so stay out. Take a look at our page for Kekaha Kai State Park if you're looking for a longer hike or for other destinations in the area. Trailhead #1: Take Hwy. 19 north of Kailua-Kona and Kona International Airport. The dirt road to Makalawena Beach is located just south of the paved road to Kua Bay, between mile markers 88 and 89. 2-wheel drive vehicles can park just off of the highway before the road begins to get rough. 4-wheel drive vehicles can continue for 1.6 miles of very rough road to a gate and small parking area just north of Makalawena Beach. There are no services of any kind at either parking area. Trailhead #2: Take Hwy. 19 north of Kailua-Kona and Kona International Airport. Find the road to Mahai'ula Bay between the 90 and 91 mile markers. There are restrooms and picnic tables at this trailhead. There is no water. Gear: Standard hiking gear. The trail is rough, so sturdy shoes or boots are appropriate. Bring plenty of water and sunscreen. Plan on packing all of your trash out from the beaches. From the North: (4 miles round-trip) From the 2WD parking area just off the highway indicated as Trailhead #1 on the map above, walk west on the road. Over 1.6 miles, the rough road passes a few fainter trails/roads, and then breaks southwest toward Awakee Bay. This portion of the road is really rough. Continue past the beautiful coral and lava Awakee bay and find a gate and 4-wheel drive parking area just north of Makalawena. Continue a quarter-mile to the center of Makalawena beach. The most northerly bay has a protected spot that's very calm. ʻŌpaeʻula Pond is behind Makalawena and its twelve acres are a National Natural Landmark that protect nesting and breeding areas for some native Hawaiian birds. It's surrounded by private property, so stay on the beach. From the South: (2.2 miles round-trip) From Trailhead #2, hike north to Mahai'ula Bay and find a well-defined trail through an ʻaʻā lava field with big views all around. The lava field transitions into a field of huge white sand dunes covered with pōhuehue, beach morning glories. 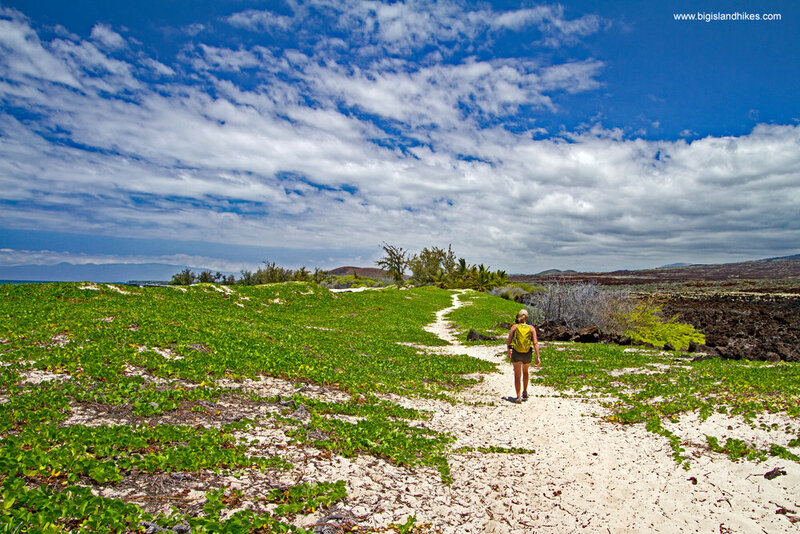 Hike through the dunes toward the back of Makalawena beach. At the northern edge of the dunes, find a short spur trail to a small brackish pond set in a stand of palm trees. Keep out of the pond.